Attention! Read all instructions before attaching the ProClip. 1. Remove the screw at pos. 1. Clean the surface at pos. 2 with the enclosed alcohol pad. Peel off both adhesive tape covers on the ProClip. 2. Place the lower part of the ProClip, with hole, over the hole at pos.1. Screw in the screw. 3. 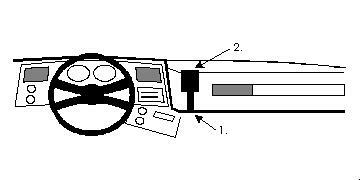 Press the upper pat of the ProClip, with adhesive tape, against the dashboard at pos. 2 so the adhesive tape attaches to the dash.